Ghost hunters around the world know that paranormal activity comes in all shapes and sizes. If you are planning on going on a ghost tour or participating in a ghost hunt, it’s important to know what type of ghosts you could encounter. This list can even help you identify an otherworldly presence in your pictures! Orb ghosts are typically considered the first stage of a spirit’s physical manifestation. Experts speculate these ghosts are the most primitive form of human, animal, and nature spirits. They are characterized for their globular shape, their transparent white/blue color, and their ability to hover midair. These ghosts are most often captured on film by ghost enthusiasts. Occasionally they are even caught on video, in which case the orbs have a tail. Experts use this tail as proof of authenticity, because it indicates the orbs were traveling at a high rate of speed. Orbs are usually found outdoors and at historic sites, so if you are taking an outside ghost tour there is a chance you could encounter one of these orbs. If you plan on taking pictures during your tour, however, be wary of flash, dust, snow, drizzle, and insects, all of which can appear as orbs in a photo. Funnel (also known as vortex) ghosts are the second stage of spiritual manifestation, because their spiritual energy stretches beyond the confines of the orb’s bubble. They are characterized by their swirling funnel shape, which is longer and narrower than an orb. Unfortunately, spotting one of the funnel ghosts is rarer than spotting an orb. They are typically found inside homes and buildings, which leads many experts to believe they are relatives or former residents of the building they haunt. If you do tour an old building and come across a sudden cold spot, chances are you have encountered a funnel ghost! A quick word of caution: if you plan on taking photographs of your tour, be careful of exhaled breath and cigarette smoke. These can make it seem like you’ve captured a funnel ghost on film, when in reality it’s just human activity. The most evolved stage of spiritual manifestation is the apparition stage. This type of ghost is what all ghost hunters aspire to catch on film (although they are the rarest type). Typically these ghosts are disembodied spirits that appear as a transparent human form. Although they are often faint, disfigured, or incomplete, these spirits are recognizable as either human or animal. Sometimes these ghosts are even recognized by living relatives! These ghosts can be found in old homes, hotels, theaters, and cemeteries. People often speculate these beings are unaware or unwilling to accept their death. Apparitions can be caught on camera, where they are most commonly found in the background. Some appear aware of their surrounding or camera, while others go on as if they are continuing their daily routine. Winter Got You Down? We’ve Got You Covered! We’re getting to the point of winter that feels like it will never end. The cold has set in for what feel like the rest of eternity. This is the time of year when people begin planning their summer vacations, the prospect of sunny, sandy beaches warming our chilled bones. With Florida being one of the most popular vacation destinations, we thought we’d highlight a few of The Sunshine State’s most haunted hotspots for you, your friends, and family to check out this summer. 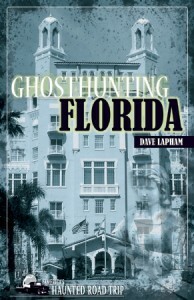 These and other haunted hangouts can be found described in further detail in Ghosthunting Florida by Dave Lapham. For being less than 100 years old, the Biltmore Hotel has accumulated quite the history. Constructed in 1925, the hotel housed speakeasies and a casino during the Prohibition. In 1942 the hotel was converted into a hospital that treated soldiers returning from World War II. The Biltmore was renovated once again in 1992 and the next decade saw remodeling and updating making the hotel grander and more opulent than ever. But through the Biltmore is more than just a historical artifact for the city of Miami; it is one of the city’s most haunted spots. The hotel boasts dozens of ghost encounters, from Thomas “Fatty” Walsh, Miami’s most powerful Prohibition-era gangster, to the “Woman in White”. An historic landmark and haunted hotspot, The Biltmore is certain to be a tour you won’t soon forget. Pinewood Cemetery Daytona, FL The haunting of Pinewood Cemetery goes back to 1877 and the untimely death of Alena Beatrice Smith, the most commonly spotted ghost in the cemetery. One of the most paranormally active areas in Florida, Pinewood Cemetery is said to be filled with the souls of many dearly departed who linger still. For the ghost-hunting enthusiast, Pinewood Cemetery is a must. Homestead Restaurant Jacksonville Beach, FL It’s hard to tell whether the Homestead Restaurant is more famous for it’s delicious, southern, home-cooked food or for it’s haunted legends, but one thing is for sure, both aspects of this iconic Jacksonville Beach spot draw an array of visitors. The building, constructed as a personal residence in 1932, was left to Alpha Paynter, who used it as a boarding house until 1947, when she refurbished the building into a restaurant. Alpha is said to still be lurking at the Homestead, often seen sitting by the fireplace and walking the upstairs halls. The Homestead has hosted an array of owners, yet has consistently provided good food and good ghost stories. Whether you’re in search of a ghostly encounter or some of the best friend chicken you’ll ever have, you definitely need to check out the Homestead Restaurant. This blog post was written by our intern, Katie Butts.